You'll know the cloth from which 'Quartet' is cut pretty fast. 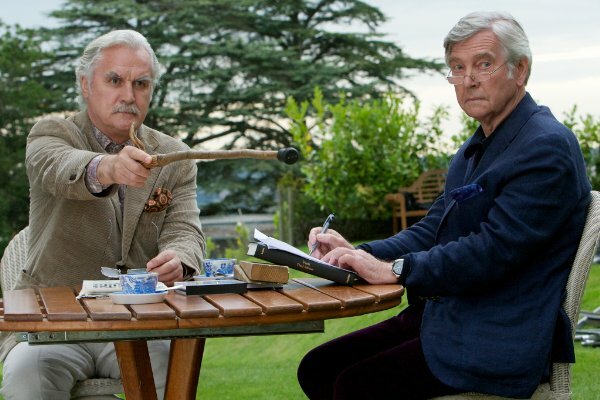 The film is almost entirely set in a friendly retirement home full of opera singers and classical musicians that are past their prime. But it's in financial trouble! The only way it can be saved is for four once world famous opera singers is to band together and perform their signature piece, thus raising enough money to keep the place going. But they've all got problems and little bits of personal development that they have to get through before they can get back on stage, prove that age is no barrier to success and give the best damn performance of their lives. 'Quartet' winds a familiar path through a setup that's as creaky as its characters, who are played by the cream of British establishment acting. 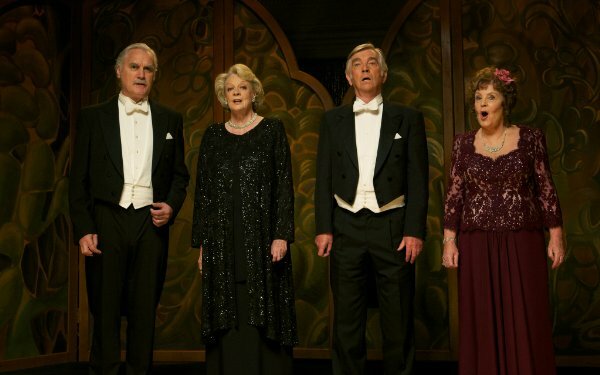 Our quartet is composed of Jean (Maggie Smith), Wilf (Billy Connolly), Reginald (Tom Courtenay) and Cissy (Pauline Collins). In supporting roles are a mixture of established theatrical performers, notably Michael Gambon and Andrew Sachs and a smattering of actual retired classical performers, none of whom I recognised, but all of whom get a nice shout-out to their careers in the credits. These leads are about as safe a set of hands you could hope to hire for a film like this. There is no conceivable way that Billy Connolly is going to misfire in a role that primarily requires him to say quasi-sexual inneundos to pretty young nurses. Likewise, Maggie Smith plays the role of a slightly depressed elderly opera singer struggling to regain her confidence brilliantly. In one sorrowful stare through a pane of glass she conveys everything you need to know about her misery at ageing and having to move into a retirement home. 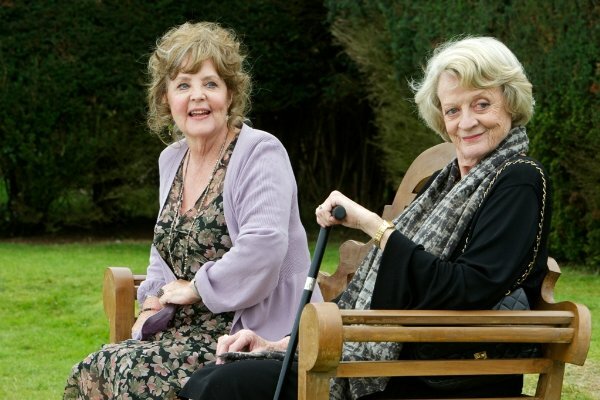 it's impressive, but then, it's Maggie Smith. Of course she's going to be good. The highlight for me is Michael Gambon as 'Cedric', the overbearing bumbling musical director. As a minor character he's not burdened with the serious, sad scenes that the central quartet are, and gets to cut free a bit, overacting in what seems to be his Dumbledore costume minus the beard. 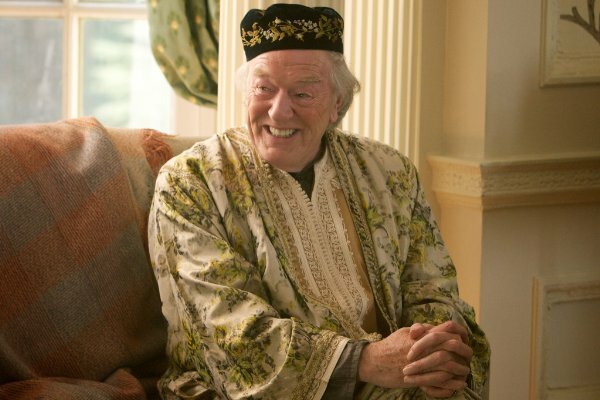 Maybe this is just Gambon's style now? You very quickly realise here that the film is set on an course, and is inexorably plodding towards a big concert finale. As soon as they mention this, it's just a matter of when, not how we're going to get there. Whether a conscious choice or not, this drains a lot of dynamism from a film that is content to spend the majority of its run time meandering through low-stakes emotional conflict. I guess you have to work out who exactly the film is aimed at: the elderly. This seems primed to ride the wave that stuff like 'The Best Exotic Marigold Hotel' (which I haven't seen) have generated. 'Quartet' is a film that plays it safe at every opportunity, and treats its target audience with a faint, unconscious contempt for their critical faculties. Humourwise there's nothing original here; all the jokes in here are straight out of the 'old age' cliche book; ha, they have to piss a lot! Ha-ha look he's old and still horny! Hey look, she's a bit dotty and forgetful! Hilarious. It seems a bit insulting to assume that older audiences want the film equivalent of a cup of weak tea. Worse, the world of the retirement home is sinisterly sugar-coated. Beecham House is more of a luxury spa than a retirement home, staffed full of cheeky and cheery empathetic characters who are more than happy to indulge their elderly patients. This is a fairly light-hearted comedy and I didn't exactly want the film go all Haneke on me, but maybe a few quick acknowledgements life in an extremely plush hospital isn't all happy fun times wouldn't have gone amiss. A prime example is a light-hearted scene where Wilf (Connolly) negotiates with the Doctor that runs the place about going out to a restaurant for dinner. It's presented in a fun, flirty and friendly way, but there's a sinister undertone of enforced confinement. 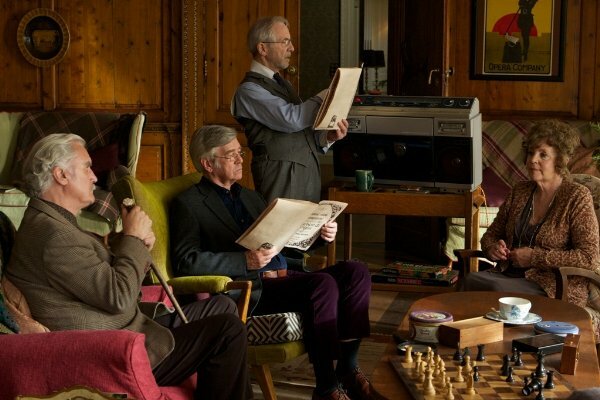 'Quartet's message is inarguably a noble one: old age shouldn't be a barrier to achievement and that a new chapter in our lives can come along right when you least expect it. But all of the personal growth that happens in the film is the result of our leads surrendering their independence and trotting off to live in seclusion in the countryside with other old people. Beecham House may be kind, opulent and friendly, but it is a cage. The film feels like the kind of thing that a cold hearted son or daughter with their eye on their old Mum's house might show her to try and convince to her move out of the place. "Oh look all your friends will be there! And the nurses are so friendly! There's even zumba!" 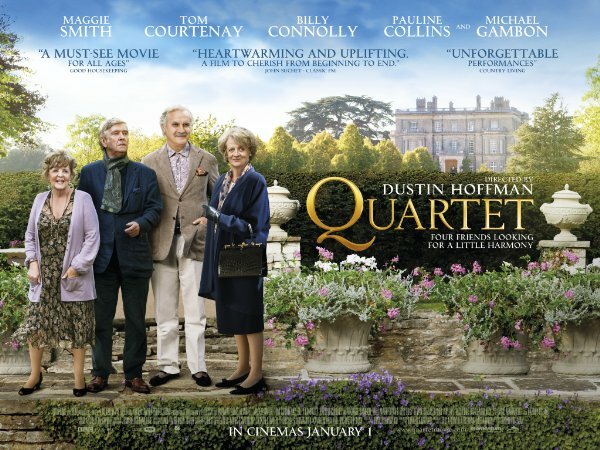 But 'Quartet' doesn't only stumble in delivering its uplifting message, it's a structurally flawed film and, like an ill-made souffle, completely collapses towards the end. Dustin Hoffman, in his directorial debut, has made a film that's sickly sweet in it's imagery. It's hard to gauge just how much time passes between scenes as it feels like damn near every outside shot is taken on a hazy summer evening as the sun is about to set. I get it Hoffman. The sun is setting but it is still beautiful. Perhaps this isn't quite as clever and subtle as you think. The film shamelessly exploits an overly twee rural England aesthetic, characters traipse through compositions that look like they've been ripped from the front of a tin of shortbread. These aren't the fastest moving characters in film either, so you're going to drink in this cloying countryside postcardiness whether you like it or not. Despite all this, I am still a bit of a sucker for films that end in a big concert scene. You know deep down that everything's going to work out alright, but there's behind the scenes trouble, last minute panics, sudden losses of confidence and so on. It's manipulative and cliched, but does a workman like job of ratcheting up the tension. But then two things happen in quick sequence that sucked out whatever goodwill I had left remaining for the film. They're spoiled below, but frankly it's better you know about them now rather than waste your money. The central pressure on our leads is to raise enough money by putting on a concert to save the luxurious, friendly retirement community that they live in. This means there is a certain pressure of responsibility on our leads, they must each risk their own dignity for the community that supports them. This gives them a heroic nobility that is vital in getting us to sympathise with them. But this structure means that the real triumph isn't them actually performing, it's just that they will appear on the bill. The film actually calls attention to this, saying "we've saved the home!" before the climax. Doing this pulls the plug on the wider drama going on around the characters. I am firmly part of the demographic at which this film is aimed, but I did not feel in the least insulted by its treatment of old age. The director is old. The cast is old. It is unlikely that they will collude to insult themselves. The minor and sometimes major inconveniences of old age and dotage are PRECISELY what we want and need to laugh at - well I do anyway. That, I suspect, is why at the showing I attended there was spontaneous applause as the credits rolled. That is why people stayed to read all the credits to the very end. I can't really disagree with what you say about the older demographic having the right to have mediocre popcorn films marketed to them, but even so it seems a bit depressing. Why settle for mediocrity? I've got no doubt that Hoffman and his cast had nothing but the best intentions for this film, but they've fallen well short of the mark. It doesn't even function as a good popcorn flick, the entire film is spent building up to an climax that never comes. I've since found out that they did shoot an ending with the cast singing the Rigoletto, but had to discard it as it wasn't good enough. Which is a bit of a depressing indictment of the film's message. That's not to say they aren't things to enjoy in the film, all the performances are great - but warm and charismatic performances aren't enough to carry a deeply average film.